City tour in the "City of Kings" - Daily departures in the morning(Duration 4 hours). Lunch buffet at the restaurant chosen. As every morning, our kitchen staff will begin very early to have him ready for the breakfast. Visit the Commonwealth of Puerto Miguel, where you can have the opportunity to view and share the rich culture, folklore, tradition and experiences of the locals. In this community may also purchase high quality crafts, prepared by the same people on the basis of exotic woods, seeds, palm fibers, etc. Since you're used to our service, but it will be followed by the amazing variety of cuisine that is designed for you Our Chef will always be aware of their tastes and preferences, but this time being his last meal with us our staff try cooking a memorable experience. At this time aboard the auxiliary boats we drive to the port city of Nauta, where our ground staff will be waiting to take you by bus to the city of Iquitos, 95 km. away by paved road. Departure flight to Lima where our staff will be waiting again to greet and transfer to your hotel for rest. (Photo: Rio Yarapa). After a good breakfast, guests are picked up from the comfort of their hotel on time. Then we will begin our city tour with a visit to an old warehouse where it is made grape brandy, famously known as Paracas. Here we learn the whole process of how to do the Paracas, guided by an experienced warehouse worker. After visiting the winery, visitors will be invited to taste or try out the different types of Paracas and wine that the winery produces. Our tour continues with a visit to the Regional Museum of Ica, here visitors can see interesting ancient remains of different cultures that developed in the department of Ica. Finally we will go to the Huacachina Oasis, which is located just 5 km from the center of the city of Ica. In this beautiful lagoon, visitors can enjoy the tranquility of the place and walk around in search of good photos. The huge sand dunes that surround the lake allow visitors to practice one of the most exciting sports in the area on sand table, popularly called Sandboarding and finally spend the night in the hotel. (Photo: Laguna de la Huacachina). On the morning with breakfast, transfer to Nazca Airport for a flight over 45 minutes on the Pampas of Nazca, where the ancient pre-Inca drew huge figures of animals and plants, so undiscovered, many believe that these figures were made by extraterrestrials, among which are the monkey, a spider, a hummingbird, etc.Then he will visit the "Cemetery of Chauchillas" then move passengers to the bus station Nazca to make their journey to the city of "Arequipa" that usually takes 10 hours, in this city our staff will make moving the bus terminal to your hotel in Arequipa where he had spent the night. (Photo: Spider Nazca Lines). Early morning departure by bus towards the Colca Canyon, past the foot of the volcano Chachani. During the trip, the ride through the pampas and Horsemen Cañahuas where are Vicuña National Reserve and Vizcachani, La Pulpera, Callalli, and Tuti Sibayo Villajos. Reach an altitude of 4,000 meters above sea level where the flora and fauna will appreciate the beautiful natural lakes and Sea Bofedales Caught with giant rocks in the form of castles. We arrive to Chivay Colca Valley for lunch. Afternoon visit to the hot springs of La Calera, where we will stay for a period of one hour and 30 minutes. These baths are medicinal thermal water, which surpass 40 degrees, good for physical illness. Accommodation in the Colca Valley. (Photo: Vicuñas on the plains of Arequipa). After breakfast at hotel, pick you up and took them to the airport in Arequipa, there it will check and take a one-hour flight to Cusco "Archaeological Capital of America" Hence our staff will welcome and transfer from airport to hotel Cusco, where we take a mate coca.After lunch at 14:00 hrs will begin the guided tour that includes visiting the center of the ancient city of Cusco, the Plaza de Armas, the Cathedral, the Monastery of Santo Domingo, Koricancha Temple and the nearby ruins of Kenko, Puka Pukara, Tambomachay and the fortress of Sacsayhuaman, built with huge rocks that so far remains an enigma mobilization and use of these, there being no quarries in the area. At 19:00 hrs. (Photo: Plaza de Armas Cusco). This day we will tour the Sacred Valley of the Incas tour that started at 08:30 hrs in the morning, collected from the hotel to Pisac, which is a typical market, with picturesque cultivated terraces on the mountain. 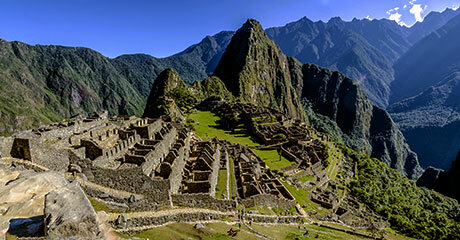 Visit the archaeological site of Pisac. It is also famous for its fairs where you can buy beautiful handicrafts. Then we head to Urubamba where we have included a lunch buffet. Then we will go to the Fortress of Ollantaytambo, where descendants of the Incas living in the home of the Incas. Finally we went to Chinchero to see its market and the archaeological group with typical Spanish overlaps the Inca constructions. The tour had just averaging 19:00 hrs in the Plaza de Armas of Cusco. Overnight at hotel in Cusco. (Photo: Sacred Valley of the Incas in Cusco). Quinceavo día: Free day in Machu Picchu "The Lost City of the Incas"
After breakfast, we will bring you to the airport in Cusco. We will take a plane to take us an hour to Lima, there will transfer to the hotel. After a rest we will visit one of the most renowned museums of our country, the Museo de Oro, La Sala Museo Oro del Peru shows in its eight rooms, pre-Columbian objects of gold and other precious metals from pre-Inca cultures of northern Peru. In the exhibition you can admire the beauty and complexity of pre-Columbian art, but also may include more than the magnificence of this exhibition, the symbolic value and hold sacred. This day will also visit the Magic Water Circuit, a set of 13 ornamental fountains that were built in the Park Reserve, the nation's cultural heritage. These sources have set a Guinness Record to be "The complex of the world's largest sources in a public park". (Photo: Sources Ornamental Magic Water Circuit).